These series of videos shows how to easily Refine and Smelt Gold from Computer Memory Chips. 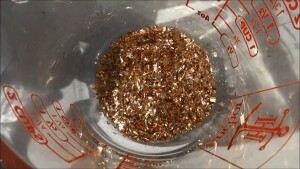 In the first video I’m recovering Gold from computer Memory Chips (RAM).The Part 2 video on how to take the gold from computer chips and refine it to a more pure metal and smelt it.In Part 3 video, I’m doing a purity test on the gold I recovered from the computer memory chips.If you follow this process, you will be able to convert all of your old and outdated computer chips into pure gold that you can turn around and sell for money. It’s a great way to salvage your old electronics and get some value out of them.